When in Paris, there is no better treat than a fresh croissant paired with un café. “Paris is a moveable feast” as Hemingway once said, so the occasional indulgence is almost a must. Last year, I traveled to Paris frequently for work and found myself revisiting many pâtisseries and bistros for French desserts. Some blew me away at first bite and some were simply classics. Here are three spots I personally adored in Paris, alongside some neighbourhood favourites for a post-feast stroll. 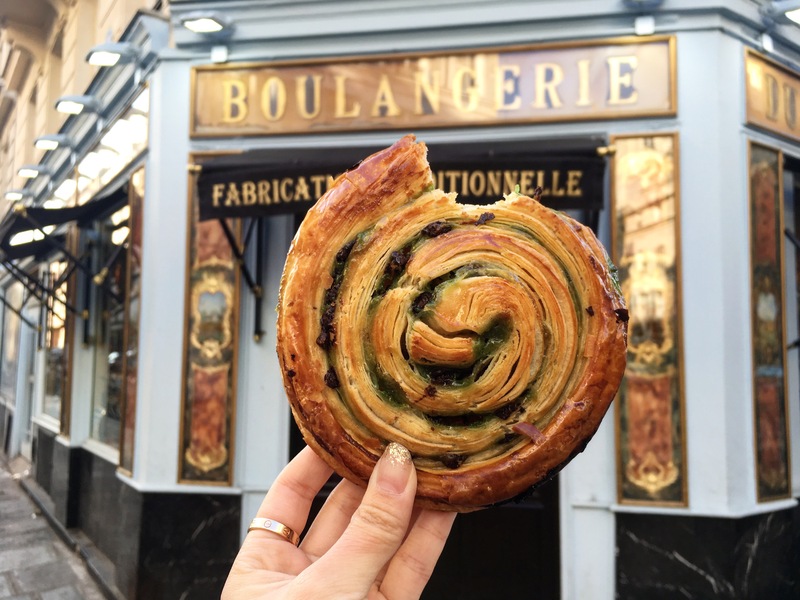 Waking up early to arrive, order, and devour a fresh escargot before grabbing an assortment of pastries for my colleagues was a delicious routine of mine. Note that Du Pain et Des Idées very recently added a coffee list to their menu. I can never resist a coffee with my croissants but be warned you’ll find much better options elsewhere. That being said, the pastry selection is more than impressive and the escargots are simply irresistible. Truly an icon of my Paris trips. Previously the pastry chef behind Fauchon, Sébastien Gaudard has a charming pâtisserie next to the Tuileries Garden. The shop is bright and airy, with a gorgeous display of decadent desserts on the first floor and tea salon on the second floor. Sébastien Gaudard has quite an extensive menu. Among them the Paris Brest stuffed with praline cream is a crowd-favourite and so is the Mont Blanc cake. Because I like to visit in the morning, I also gravitate towards the viennoiserie and pick out a Chausson aux Pommes as well. Sébastien Gaudard is a lovely spot for classic French desserts in the 1st arrondissement and perhaps that’s also why you do pay dearly for it (~8 euros per cake!). That being said, the shop is tucked in the corner of the Tuileries Garden and therefore conveniently on the way to Musée de L’Orangerie. A sweet start to the day followed by a visit to the Tuileries Garden and surrounding museums is the perfect Paris itinerary. When done right, soufflés are fluffy as a cloud and just dreamy–pretty much what I captioned on my Instagram post after my first visit to Le Récamier. My Parisian roommate back in university days said that Le Récamier had some of “the best soufflés in Paris” (and Vogue apparently thinks so too). So when I finally had a spoonful of the chocolat noir soufflé with a glass of chardonnay, I was pretty thrilled that it exceeded my expectations and more. There are quite a lot of savoury soufflé options as well–we ordered the famous Henry IV, a chicken gravy soufflé that was bursting at its seams a bit! As Le Récamier is in the luxurious 7th arrondisement, there’s also a lot of nearby shopping available. For gourmands, visit Le Bon Marché and its adjacent food hall, La Grand Épicerie, for some gourmet shopping. You can most likely pick up all the ingredients needed to whip up your own French dessert! I kept the list short but hopefully sweet. I have a long list of places I loved in Paris and I can’t wait to share it with you guys. Anyways, I’ve been told a dessert a day may not be the secret to Parisian chic but sometimes… it’s simply too good to resist. so much to explore & devour in Paris!! Jade love this post! Now I’m all ready to hop a plane to Paris! However, I’m currently eating and drinking my way through Vancouver BC…. Thanks Emily! Enjoy your travels, will be looking out for some new posts!